…………..Christmas Day will be just about over. This single day may be fun, joyous, tedious or whatever you choose to make it. You may have shopped, cooked, decorated and planned for weeks or even months. Was it worth it? My approach to Christmas has become more low-key as the years go by. In the meantime, life goes on and there is still washing and ironing to do as well as meals to prepare. Tonight’s dinner is an example of my ‘speed cooking’ on weeknights after a full day at work. I made Broccoli with Tuna Sauce which is one of my own adaptations of a recipe I saw in a magazine about 30 years ago. There are no real quantities – just what seems reasonable. Fry some diced onion, capsicum and a bit of Tabasco sauce. Add a can of crushed tomatoes and 1/2 large can of tuna (shredded). Simmer and reduce the liquid a little. Lightly steam a head of broccoli broken into florets. Drain any excess liquid from the broccoli then pour the tuna sauce over it. Top with grated cheese and breadcrumbs and crisp under the griller. I use a mixture of almond meal and flaxseed meal for a gluten-free option. This meal took 20 minutes from starting the preparation until I served it. 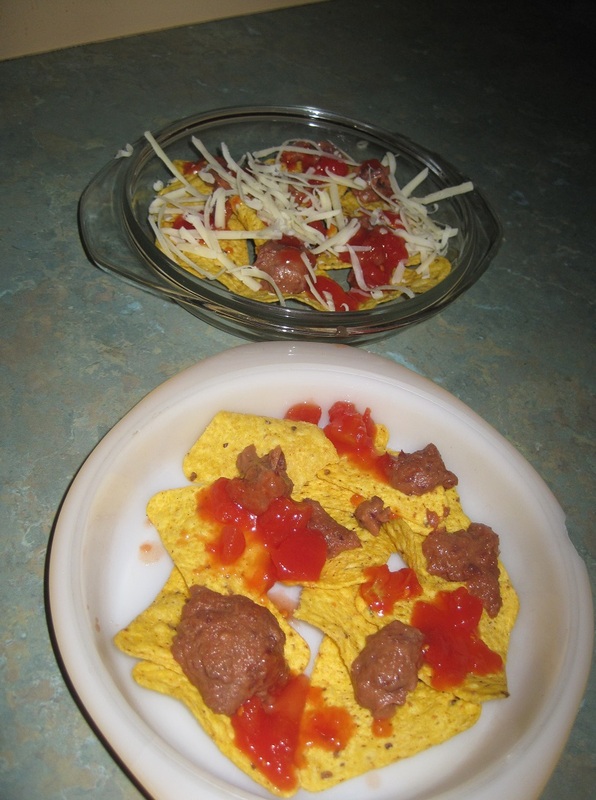 As per my menu plan for the week , we had nachos for dinner last night. Like everything I prepare on weekdays, it is quick and easy. I make my own refried beans from the recipe here using dried kidney beans. I freeze the mixture in 500g tubs for future use. Last night I used tinned crushed tomatoes but you can use chopped fresh tomatoes or even a bit of diluted tomato paste. 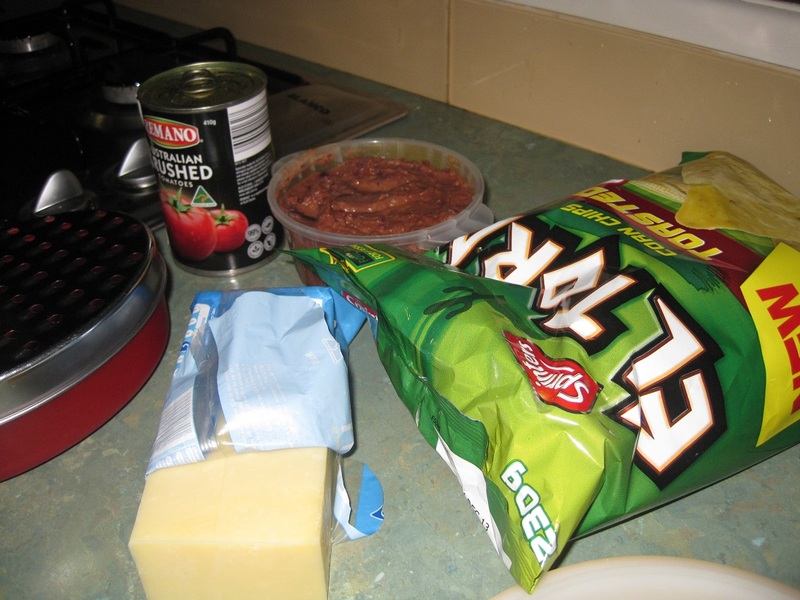 Here is the first layer – corn chips, refried beans, tomato and then grated cheese. Add layers until desired quantity is reached. This is 3 layers ready to go into the oven. I use 2 small Pyrex casserole lids as I find the Pyrex easier to clean than a metal tray. 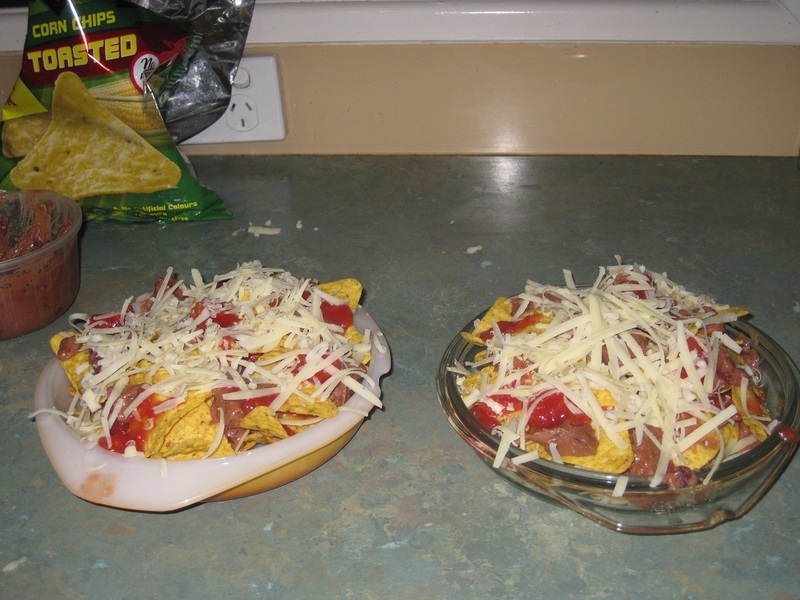 This used half a packet of corn chips and is a substantial meal for 2 adults. I serve this with home-made guacamole and yoghurt on the side. Total preparation and cooking time is about 20 minutes.